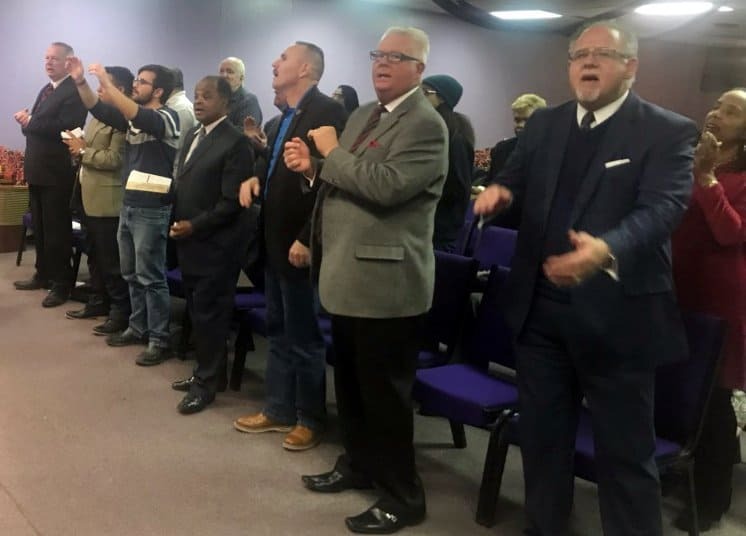 DETROIT (BP) – Not far from Eight Mile Road, a historic racial dividing line in Detroit, more than 100 diverse Southern Baptist pastors, state leaders and laypersons worshipped together on Martin Luther King Jr. day. The 7 p.m. service marked a milestone for 78-year-old African American pastor Robert Coverson, the event’s preacher, who marched in Detroit with King during the civil rights movement. Many suburban residents are afraid to cross Eight Mile Road and venture into the deep inner city during the day, Coverson said, let alone after dark. Pastor Roland Caldwell, vice moderator of the Detroit Baptist Association, hosted the event at Burnette Baptist Church. Mathew Vroman, a white pastor who leads the predominantly black Eastside Community Church (SBC) in Eastpointe, organized the event with Caldwell to help unify the community. The event emphasized unity in Christ, spotlighted the church’s efforts to plant diverse churches, and proclaimed Christ while remembering King. The SBC “has plateaued in the South and if it’s going to grow, it has to go to the north,” Coverson told BP. “And if it doesn’t deal with this issue of confirming through their fruit that they’re no longer the organization that historically discriminated against people of color, then people of color will not trust them or want to be a part of what they’re doing. During Coverson’s presidency, he encouraged the BSCM and state Baptist associations to adopt Martin Luther King Jr. Day as a paid holiday for employees, which would allow greater denominational participation in such events. Caldwell recalled King’s statement that 11 a.m. on Sunday marks the most segregated hour in the nation. “Whites stay in their church and the blacks stay in their church,” Caldwell said. “Jesus said that by this all men shall know you are my disciples, that you love one another. Love is action.